Potlatch was my very first tournament back in 2003, and since then I’ve played all, but two years (the exceptions being the dark years of the US Open falling on this special weekend). Every year I’ve played, this tournament has held its own character. I’ve picked up for college alum teams with a few high school friends (back when teenagers were allowed to play), with my own college or club teammates, and on teams full of former Sockeye players looking to rhyme their way to the top of the A division. I’ve won every game and lost every game and played the last day in every different bracket a person can play. I’ve “done Potlatch” just about every way a person can do Potlatch. The one thing that has been consistent over all those years is the feeling of belonging, the feeling that these people I’m choosing to spend time with are my people, and that we’re united by a common bond. Ben Demboski recently reflected on this phenomenon and I wholeheartedly agree that this community is something special. A lot of people refer to their pocket of the ultimate community as their #frizfam, their team as a family, or proclaim their love for each other loudly, publicly, and often. This year I played with The Gay Agenda, a team of queer-identifying players and allies. It was a celebratory festival of rainbows, glitter, and self-expression. (If you were anywhere near Sixty Acres Park the weekend of Potlatch, I assume you’re finding glitter where you least expect it. You’re welcome.) Our team wasn’t out to win anything but hearts and minds, a significant frame-of-mind shift from my competitive season, and the experience was incredibly empowering. Over the past couple of months, I’ve been struggling with my identity and its impact on the relationship with my biological family. There have been long email threads, some manipulative power plays, and general feelings of unease in being my whole self with my family. This is by no means a new development in my life, as is the case for many queer people. For me, it came to a pretty clear, gut-wrenching head when the Cascades Cup (aka the first mixed pro ultimate game ever) fell on Good Friday and my parents refused to come to the game and watch me play. What was amazing and beautiful is that my chosen family was there supporting all the athletes and owners taking a stand for gender equity on the pro ultimate platform. People of all genders who never go to Cascades games because they refuse to buy into a model that, with rare exception, excludes women, came to the game to say that there is a market for mixed pro ultimate, that there is interest in watching women athletes play. As a community, those who attended the game and watched the livestream chose to show support for gender equity in the interest of making things better for athletes and young fans who are hungry for role models. 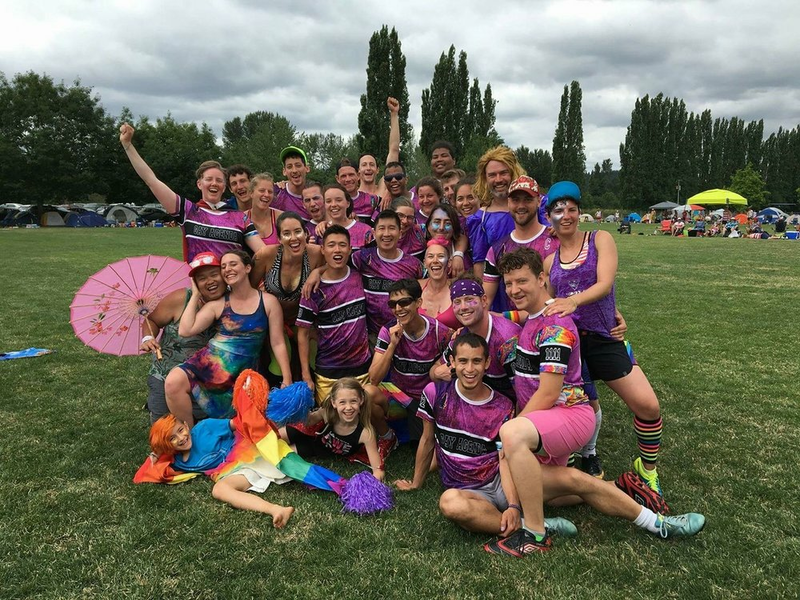 At Potlatch, every person who visited The Gay Agenda’s glitter station, got a temporary tattoo from us, asked to throw on a rainbow cape and play a point with us, or participated in our spirit dance was showing support for queer athletes in ultimate. The reception to our team was overwhelmingly positive and given the spring I’ve had (and the whole country has had, thanks to the current administration), incredibly healing. Our internal team environment was everything a person could hope for. Everyone participated in group activities both mundane (like cleaning up the campsite) and magical (like halftime changing to hug time). In our opening huddle, we talked names and preferred pronouns as a part of our introductions. We didn’t worry about genders when we walked on the field, beyond making sure we had a minimum of three “female-identified for the purpose of satisfying gender ratios in mixed” people. Since gender is a construct, we’d call “construct across” on the line for defense, or we’d match up gay across on the line (rather than straight across). I didn’t see any of the classic pitfalls of mixed pick-up teams - if someone was open, they got thrown to. If someone of any gender made a mistake, there was only positive support from the sideline, and they still got thrown to the next time they were open. When female-identified players gave constructive feedback, they were heard and our team adapted to better open up space for the active cutters. During all the games I played with The Gay Agenda, I never doubted my safety on the field. While every Potlatch I’ve attended has been great, this year was the first year I felt like I could be my complete and whole self on and off the field. The level of care and attention my team gave to fostering an inclusive environment --where being yourself was great and valued and loved-- was staggering. The cumulative effects of setting an intentional culture for the team and acting on that culture in small, meaningful and consistent ways, meant that all players on the team could truly enjoy their weekend as their whole selves. The ripple effect of other teams and individual players showing support for and participating in this positive culture allowed our team to thrive and others to tap into what we had created, no matter their identity. When we decide to be good to each other like this and make that a central tenet to how we organize, act and play, it benefits everyone from all backgrounds. Because we view our community as the family we choose, it’s important to dig into the work of understanding each other and ourselves, and how societal structures impact us. Because we love each other, we strive to be better for each other and make things better for each other in society at large. We’ve made some great progress. Let’s keep building.